One of our own, Bill McCrary, aka casekiska, got in touch with me a few weeks ago to talk about finding a permanent home for a historic bow he has in his possession. Somewhere along the way, Bill offered to send me his book, The History of Wisconsin Bowhunting". Of course, I said, "yes" and a couple days later it arrived. 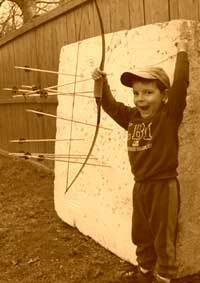 I didn't know if this chronicle of Wisconsin bowhunter history would capture me because my focus is almost entirely on the archery history of San Diego. However, I must say, not only did Bill succeed in making it genuinely interesting, I discovered a huge amount of strategies for use in furthering the course of an archery club or even starting one. If for no other reason, it is worth the read to see just how much effort was put into the sport, by a few dedicated folks, we pretty much take for granted these days. I have a few chapters yet to finish, but I couldn't wait to give accolaids for the writing of this book. I highly recommend! I someday aspire to achieve, for San Diego, a fraction of what Bill has put into this book for Wisconsin. I'm gonna' have to get me a copy. Yep. A good read. Two thumbs up for sure. Thank-you Jim. I am surprised and humbled by your kind comments. My goal in writing the book was to gather and preserve WI bowhunting history before it is lost to the years. The effort truly was a labor of love that I hope will be judged to have honored the state's pioneer bowhunters and the legacy they left for today's archery enthusiasts. Again, thank-you. I endorse saving history no matter where it is!! Where can one get a copy of that book? The Footed Shaft (in MN, 507-288-7581), 3Rivers Archery (in IN, 260-587-1003), WI Bowhunters Assoc. (in WI, phone 715-823-4670), or select archery pro shops in WI. Bill was there every step of the way..Very good read. Do a fellow LW'er a favor and let everyone know what you think after the read. The phone number listed above for 3Rivers is an office number. The correct 3Rivers ordering number is 260-587-9501. Thank-you.